Magnolia Home Ent. The Host - Collector's Edition (Blu-ray) The film revolves around Park Hee-bong (played by Byun Hee-bong), a man in his late 60s. Park runs a smallsnack bar on the banks of the Seoul's Han River and lives with his two sons, one daughter and one granddaughter. The Parks seem to lead a quite ordinary and peaceful life, or maybe a tad bit poorer than the average Seoulite. Hee-bong's elder son Gang-du (by Song Gang-ho) is an immature and incompetent man in his 40s, whose wife left home long ago.Nam-il (by Park Hae-il) is the youngest son, an unemployed grumbler, and daughter Nam-joo (by Bae Du-na) is an archery medalist and member of the national team. One day, an unidentified mutant suddenly appears from the depths of the Han River and spreads panic and death, and Gang-du's daughter Hyun-seo is carried off by the monster and disappears.All the family members are in a great agony as they have lost someone dearest to them. But as they find out she is still alive, they resolve to save her. Nicely done but lightyears away from great. Overhyped too. I have no idea why this film is being compared to ALIEN or JAWS. It is offensively inferior. Basically, there is a Korean family. Then there is this monster who captures the little girl. Family goes after the monster. Monster keeps the girl in its sewer hideout full of other victim's bones. Family finds the monster. Monster is attracted to the city where there's a trap. Monster gets killed. The effects are nicely done and the crowd scenes where the monster runs at large and eats people are very well staged (and must have been expensive to shoot). That explains why there are only two of those big scenes in the entire film. The rest of the film is just the family looking for the monster and little girl hiding from the monster. The film lacks more spectacle (although the little it has is very well done). And the acting is very strange. It is very histrionic... like if everybody were in a Masked Rider or Ultraman episode. In a way, it looked like those old Japanese TV shows... but made with CGI. I got very disappointed after all the hype. I am sure it worked a lot better with Asian audiences who are more in tune with many elements... like the histrionic acting, some characters, the fact that one of the protagonists is an Olympic bow and arrow winner (a big sport in Korea)... and many other things. Gwoemul follows in the footsteps of Gojira to become an instant classic. Gwoemul is a cautionary, political tale of environmental awareness (ultimately caused by the stupidity of an American) in the vane of Gojira. Above all, it's a story about four family members banding together for a common cause. Park Hie-bong (Hie-bong Byeon) and his son Gang-Du (Kang-ho Song) run a small food stand near the Wonyho Bridge along the Han River. Gang-Du, a somewhat dim witted man, has one daughter, school girl Hyun-seo (Ah-sung Ko). He also has a brother, Nam-il (Hae-il Park) and a sister Nam-joo (Du-na Bae). Nam-il,a college graduate with a somewhat questionable past, hasn't done much with his life except drink. Nam-joo is a national medalist in archery who can never seem to get more than a bronze. When a creature emerges from the Han River and captures Hyun-seo, the somewhat dysfunctional family has to overcome their differences to get her back. Taking on red tape, American interference, the threat of a virus and Korean politics, they stand together in their conviction that she is still alive and set out to find her on their own. Watching them overcome their general distaste for one another lead by their venerable father is entertaining, comical and at times very touching. The story and special effects are phenomenal. The acting is fantastic as long as you stay away from the English dubbed version. Do yourself a favor and listen to the Korean acting and take the time to read the subtitles. In addition, most of the humor is completely lost in the English dubbing and there are quite of few moments of brevity in this film. This is definitely a keeper rather than a renter! Overall I liked this movie. It was different from the normal monster movies that you see. Liked the part where they were eating and having to sleep, made it seem more real than most of the other films that are made. The Host is not the best monster movie ever made. It offers good times, but it really is a mixed bag film. Unfortunately I'd have to disagree with some of the critical acclaim on the box because this film is not at par with Jaws, and it certainly isn't scary. It is worth a look, but don't expect the greatest monster movie you'll ever see. WHAT IT'S ABOUT: The story begins in a morgue where two morticians are getting rid of dangerous chemicals by pouring them down the sink, where the contents went into the Han River. It takes the B-movie approach by having a dangerous creature morph into an abomination because of these chemicals. Then one day onlookers stare at a strange creature that is holding onto the bridge. It then jumps into the river, swims to shore, and then begins attacking people on the shore and eating them. When a girl gets taken by the monster, her family is determined to find her and kill the creature that the government claims the host of some kind of mysterious virus. MUSIC: The score is excellent and superbly crafted, one of the best parts of the movie. STORY: The story is uneven and riddled with holes and displays an overall sloppy presentation (Not to mention the awful ending). The lowest point of the entire film. Plus, there are some parts you can't take seriously because they are cheesy. This film's comedic humor manages to save some parts of the story but feel out of place. ENTERTAINMENT: It all depends on how much like monster movies, you can like and you can hate it. It all depends on your preferences of films. I found it to be good, but flawed because of the storyline. This film will not scare you. OVERALL: It's good, but flawed because of a sloppy story. But the great music, atmosphere, certain creature scenes, and a few extras keep things moving. THE GOOD: Cool monster, great music, cool scenes, funny humor. A bit divided on this one. One the one hand, I don't think it's anywhere near as good as the general consensus of many professional reviews who gushed over it. The dysfunctional family pulling together was nicely done and scripted. The political aspects didn't quite work for me. The monster was - if not the best CGI ever, certainly more than acceptable and as another post described, the creature design "logical". But the film, as a whole, just wasn't - for me, all that entertaining or suspenseful. I can't quite put my finger on where it missed. Maybe it was trying too hard to do too much. It was, however, refreshing to see a non-Hollywood approach to such material. The rousing /happy/ Hollywood ending this film has not. It was certainly more original and intelligent than most. Watch the subbed version, as the dubbed version I thought was nearly as bad as 70's Asian karate flicks. I'm sure there are many fans of the Japanese film art that will disagree with me, but this film made little sense. It skipped from here to there with little connection between scenes. It was hard to follow and dubbed poorly. The only positive note to it was that the monster was done with some very decent FX, looking like a carp with legs or some kind of mudskipper gone wrong. There's also a virus associated with the monster, and the government starts to spray people and takes one member of the girl's family into isolation to attempt to figure out the virus, since he seems to have no effect from it. Meanwhile, the creature roams the sewers, and renegade bands descend into the sewers in an attempt to catch it, including the little girls aunt with her bow and arrow (she's recently been in an archery contest where she froze up at the critical moment). Though the monster is good, the movie makes little sense and there's a lot of scenes that "stretch" out a little too long. I watched the movie with six other people and none of us could quite figure out what was going on. It's an entirely different mindset from American movies. It's a movie that will have to be watched more than once to figure it all out, if you have the inclination to watch it again. I don't. I just didn't think it was good enough for a second viewing. My advice is to rent, not buy, and if you are really into Japanese films you will most likely love this movie more than I did. The monster is very interesting and well executed. It is seamlessly integrated into the live action and very convincing visually. 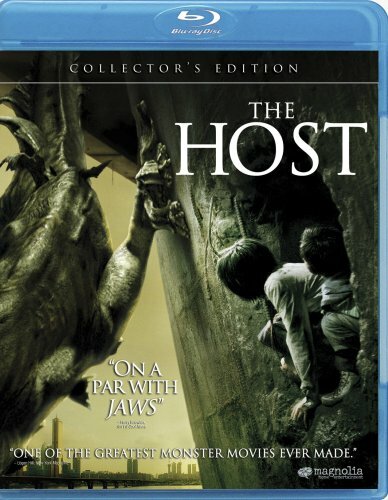 Unlike many monster films, "The Host" does not have a monster theme song or warning; it usually appears when things are quiet. In fact, the director did a good job of "zoning-out" the viewer when the monster appears. Like in real life, when in a state of astonished shock, time slows down and everything gets numbingly quiet until we zone-in again. On the downside, I thought that an aquatic mutation would not be quite as intelligent as this beast and it was just a little too indestructible for most of the film. However, the overall execution was very effective. First of all, let me state that I am an American. I've never been to Korea nor am I an expert on Korean culture (I know very little). So I can't really judge how typical these characters were. That said, most of them were just a little overblown and hammy. There was no attempt at camp, its all played pretty straight so this was a problem. Good performances to lookout for are the little school girl whom I enjoyed quite a bit, and her Grandfather who at least seamed genuine. Most of the other main subjects were sort of caricatures rather than characters. The American characters were scripted and acted just horribly and the obvious villains (even more so than the monster who is played as more of a consequence of the evil Americans than an evil unto itself). There is one American hero type but he's not very effective. I must admit enjoying the family dynamics of the featured characters even if I didn't like them and despite a little too much of them. Again, I know nothing of life around Seoul, Korea. I have to assume there are lots of bridges and trailers based on this film. It was definitely an interesting backdrop for a monster movie; particularly the bridges. The bridges were used mostly as artistic graphic elements; employing triangulation, perspective and geometry to create visually stunning imagery. I have to give credit for top notch cinematography in this film. It was a visual treat and actually above the story and characters deployed. The trailers were effective in that they provided very little sense of security, being what they are. The bridges get 5 starts, the trailers 3. -I bought the 2 disc set. I have yet to watch disc 2. However, disc one had quite a few extras itself including a bunch of deleted scenes. The picture and sound were good So this is a pretty good value. ... and you have a strange mix of brilliant visual FX, beautiful cinematography, uneven acting and a slightly bloated story. The idea of formaldehyde mutating aquatic life to such a degree is something you will need to overlook to enjoy this film(I did immediately) . You also better be ready to see Americans stereotyped as despicable opportunists without a thought for the consequences of their actions. I thought it was more comical than offensive. I never found this film too scary or gory; it's more of a drama. It has some seriously slow spots and somewhat unnecessary character development and a rather heavy handed political statement (I think it was the Directors attempt at being sublime). I found the monster scenes to be enthralling and entertaining and the overall visuals worthy of a better script. I thought it was ok. I definitely recommend "The Host" as a rental at least. When i bought this movie some guy had asked me if i was buying it for entertainment or just because. I told him i was hoping for a good monster movie; and boy was i wrong. I still haven't even watched the entire thing! It was so bad i actually turned it off before it was over(and i hardly ever do that.) The dubbing was worse than some of the old godzilla movies, the acting was phenomanally bad, the story was run of the mill, and the list goes on some more. The only thing i found somewhat good was the creature. The cgi wasn't the greatest, but it was alright. The way it traveled was actually quite creative, but it was still somewhat unimaginative. I can't believe they would say it's on a par with jaws; its not even close. This movie will most certainly NOT be a classic. To sum it up, if your looking for a bad horror film with a different kind of monster, this will probaly satisfy. Surprisingly this movie did very well with critics. Sometimes I think the movie reviewer out there likes weird for the sake of weird. One thing for sure, this is one bad movie. I rented this, hearing that it was an incredible monster movie. It absolutely isn't. This movie boarders on funny moreso than scary. Perhaps if it was presented as a comedy I could have enjoyed myself, but my expectations were that this was a new "Jaws". The monster in the movie itself has its moments, but is completely out there. It's species is either part amphibious or part monkey, judging by how it can use its tail to traverse under bridges. However, it is far from scary, and the movie itself has only slight moments of suspense, which are usually ruined by horrific acting and even worse cinematography and plot direction. The plot is overly ridiculous as well. Certain characters will randomly come into the movie, and the plot makes it as if you had known them all along. Additionally, I won't spoil anything here for those that actually want to see it, but they really stretch the imagination on how the monster is created. Further, the main character in the movie is not someone you can support and you'll spend most of the time hoping he gets eaten just so the movie will end. "The Host" begins briskly enough with a great looking monster wreaking havoc in a public park in Seoul. The creature kidnaps a schoolgirl and the girl's oddball dysfunctional family is eventually forced to resort to self help to attempt to rescue the girl because the authorities are uninterested, incompetent, and / or malevolent. This is the plot in a nutshell, and some of it works and some of it fails, while some is just boring. What doesn't work? The most obvious failure is the ham-handed anti-American perspective of the director. I don't expect most foreigners to love us at this particular point in global history, and anti-American sentiment in foreign films is an old and honorable aesthetic tradition. That said, the blatant and clumsy political critique in this film is ugly to see, adds nothing to the plot, and gets in the way of both the story and the flow of the action. This is like watching a cruddy low budget American action flick from the 80s where the villains were usually greasy stereotypes of Arabs or psychopathic cardboard Russians; neither the stereotyped ethnicity nor the discerning viewer appreciated such nonsense, and seeing the same mono-dimensional caricatures applied to Americans 20 years later is hardly what might be called cinematic progress. American arrogance, wastefulness, and contempt for the environment is what causes the origin of the monster. America then pressures the South Korean govt because they are not taking a "hard-line" position in dealing with the menace. America then mistakenly identifies the presence of a creature-related virus which causes a panic, and then covers up the mistake to avoid taking responsibility for it. Then America forces South Korea to let the US deploy "Agent Yellow" an "anti-virus" gas which is presented as causing as many problems as it claims to solve. The deployment of the dangerous "Agent Yellow" is announced amid footage of American forces in Iraq, and when the gas is actually used, it does not affect the monster but instead makes many innocent bystanders ill. How clever and subtle! Why not just have the US nuke Seoul while interspersing footage of Bush and Cheney laughing? The history of the US and the South and North Koreas is a complex and rocky one, but whatever one's take on this subject, this movie adds little to political understanding, and the many logical problems in the plot caused by the anti-American polemics of the director slows things down and makes for some stupid moments, complete with a "unusual" crane based gas delivery system spraying noxious yellow gas all over the harbor. The South Korean government's prostration before US stupidity and bad intentions is also both blunt tiresome satire, and poses another set of logical problems for the film. Does South Korea have no independent medical or scientific community that could assess the presence (or absence) of a deadly virus in a given population? Speaking of "Godzilla", the earlier film highlights another issue with "The Host" - mainly the lack of a traditional big budget monster movie feel. The creature is quite real looking and the numerous close-ups just make it seem more authentic and well-conceived. However, the money spent on a real looking monster evidently consumed most of the budget, so the scenes of monster havoc are pretty brief as are the scenes of the authorities searching for or fighting with the monster. The military response to the creature seems absurdly sparse, and the monster keeps a generally low profile. If you don't like monster movie tropes, this minimalist approach will not disturb you, but if you like the whole "Godzilla" feel to your monster flicks, you will feel a bit high and dry here. Finally, the ending is a downer, and quite a surprise considering the general tone and theme of the film. Most viewers will not be happy with the ending, and I think the megadose of pathos is stuck in there to both keep domestic Korean audiences weeping (always a box office boost in Seoul!) and to suggest that this is more of a "serious" film that it actually is. On the bright side, the cast is uniformly excellent and the way the quirky group of dispossessed and eccentric souls come together to defeat the monster is inventive and unexpected. If you know a lot about Korean culture, there are lots of interesting sub-texts on display about class and economic divides in Korean culture. The general theme throughout is distrust and criticism of authority and conformity, two of the oldest pillars of Asian society, but this is balanced by the bonds of family as the basic safety net, which is an even older pillar of Asian culture. The movie is not uninteresting, the cast is great, and the monster looks fine. The political stuff is a wrong step, and the monster movie buff may wish to see more monster at large action, but all in all this is an idiosyncratic and entertaining film. Those who are thin-skinned about anti-American diatribes (especially clumsy mono-dimensional ones) may not care for this, and horror purists may not enjoy the absence of traditional tropes and the budgetary limits, but most other viewers will find something to enjoy here. This would be a perfect 3.5 star film, but I have to round up or down, so I am rounding down because the rather lengthy runtime of the film strikes me as excessive, given the amount of agitprop poli sci stuff inserted for no legitimate aesthetic reason, so three stars it is. This had to be one of the worst movies I've ever watched. Bad dubbing,bad acting,stupid story and a silly monster. It was so dumb I skipped to the end just to see how the monster was destroyed. That too was ridiculous.